This shocking act of feigned violence against the POTUS was an explicit warning from the Black Nobility to Team Trump. 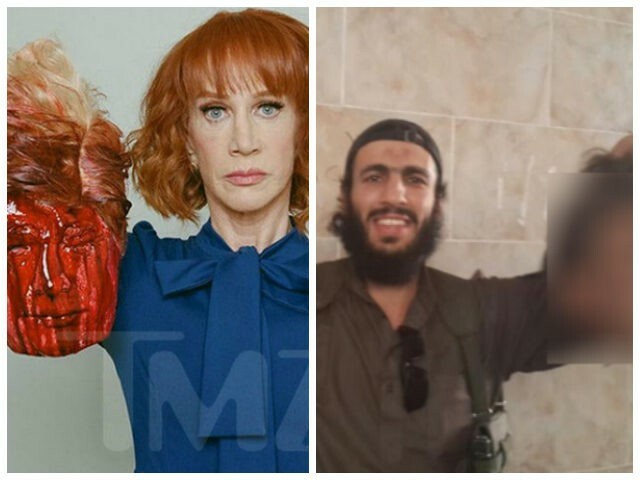 First, watch the following video to fully understand that Kathy Griffin knew exactly what she was doing when she filmed the infamous “beheaded Trump” video. 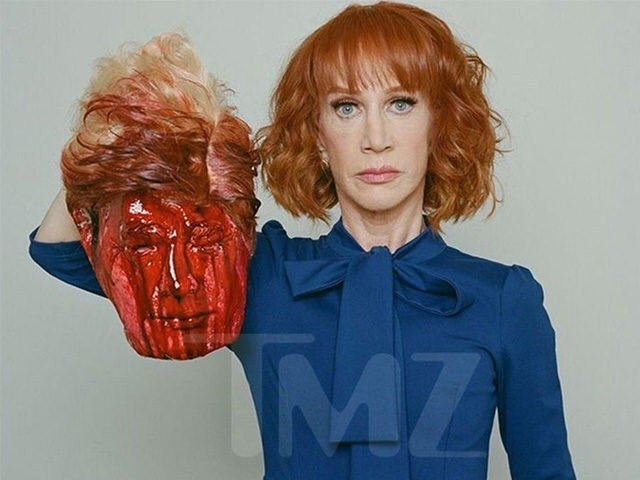 As a comedian who takes direction from the agents of Deep State, Kathy Griffin was well aware of why she was used to send such a grisly message. She also knew precisely who she was doing it for. Every so-called comedian and talk show host, who enjoys a high platform on any of the major networks, is either a card-carrying CIA agent or contractor. Hence, they are all paid agents of Deep State. Stephen Colbert and Trevor Noah, Jimmy Kimmel and Jimmy Fallon, Ellen DeGeneres and Samantha Bee are all covert agents just as John Stewart was. Their carefully sculpted entertainment personas (read: entrainment) have been created with direct assistance from the CIA’s Entertainment Industry Liaison Office. We’re talking about the original mafia dons here. This is exactly how they act. The very same bad actors are responsible for the unbridled terrorism let loose throughout the Middle East. Isn’t their terrorist organization ISIS world-renowned for beheadings and crucifixions, mass shootings and burning people alive? For anyone who doubts this grim reality, please read the following exposé. Yes, the very same MAFIA that runs the false flag terrorism across the planet is also in charge of NATO, sometimes known as the North Atlantic Terrorist Organization. They are but the enforcement arm of Deep State. Now, watch the video below which portrays Griffin’s fake apology. It’s as though the whole apology context was set up by a Deep State Hollywood set designer. Her script was so rehearsed and melodramatic that only a seasoned screenplay writer could have fabricated it. So what’s the real point of it all? Why did they do it? There are actually many reasons behind this audacious threat. Trump had just returned stateside from his “catastrophic” (as per MSM headlines) trip to Europe, home of the Black Nobility. Both his actions and his words continued to speak of his unparalleled independence, especially from the dictates of the World Shadow Government. What follows are just a few of his more consequential deviations from the New World Order agenda. #1 — Trump refused to permit his Twitter account to be moderated by Deep State attorneys before he tweets at 3 in the morning. That alone was enough to get him seriously threatened with a beheading. By using Twitter as a daily “Trump Gazette”, he has functioned as a major pillar of the Fifth Estate. Such journalistic independence is never tolerated by the those who command and control Deep State. #2 — Trump continues to trumpet the “fake news” meme like never before. His surrogates are going full bore in the same direction. The talking heads throughout the mainstream media are becoming apoplectic with rage and disbelief and frustration. Their heads are practically exploding during prime time and in living color. Trump has irreversibly branded the MSM as “F A K E N E W S” and Deep State is absolutely livid about it. #3 — Trump just blew up NATO during his trip to Europe. He also destroyed the US relationship with the hopelessly dysfunctional European Union. Trump also singled out Germany for a special blasting. Not only did Frau Merkel go ballistic, she basically announced the end of transatlantic cooperation. And, that a new day had dawned…with an AWOL America. #4 — Trump refused to endorse the Paris Climate Agreement that Obama made the signature international accomplishment of his presidency. He spurned every request to meet half way on the matter knowing that it is a fundamentally flawed agreement. Trump also made it clear that the implementation of the “United Nations Framework Convention on Climate Change” will plunge world into a global economic depression. #5 — Trump fired Comey and no one knew in advance. Yes, the chief Trumpster was able to keep the termination of an FBI Director that secret. There are not supposed to be secrets like that in the West Wing. The CIA, NSA, FBI, DIA, DHS have the White House surveilled and spied on 24/7. Trump also allegedly called Comey “crazy” and “a real nut job”. Did Trump really call Comey “crazy” and “a real nut job” or was that more fake news? This list of transgressions, in the eyes of Deep State, goes on and on; but you get the picture. The Black Nobility obviously felt compelled to send the MAFIA to issue a dire and direct threat to The Donald. That’s where Kathy Griffin came in. She’s the American face of ISIS (See photo below). And her behavior is no different than the actors who are conscripted by the C.I.A. (and MOSSAD) to stage the beheadings in the Northern Levant. And, she will probably get all kinds of new contracts and acting gigs for her blind obedience to her Deep State masters (when the dust settles, of course). As for President Trump, apparently they really don’t have any way to control him. He is the proverbial loose cannon sending cannonballs into Deep State whenever someone lights his fuse. That’s the way he has always operated. And, he’s likely to function as the same wrecking ball he has been since he first declared his candidacy in June of 2015. As a longtime builder and developer, he knows full well that Deep State must be wrecked before the American Republic can be rebuilt. Now for the $64,000 question: What does Deep State intend to do should President Trump not take their threat seriously? Remember in the movie The Godfather when they put the severed horse head right in the guy’s bed while he was sleeping? Well, that’s just how these MAFIA agents of Deep State give a warning—ISIS style.